Seismologist Germán Prieto and co-authors show a rupture of the San Andreas Fault could generate three times more shaking in Los Angeles than surrounding regions. Many of the world’s earthquake-prone regions lie atop sedimentary basins — large sections of sunken crust filled with deposited sediment. Because such sedimentary material is softer than the surrounding rock, these basins can amplify shaking as quakes propagate through the Earth’s crust, generating significantly more motion than in rockier regions. In an earthquake, cities like Los Angeles and Tokyo that are built on sedimentary basins can experience much more intense shaking over a longer period of time — a consequence that earthquake simulations have predicted. But such simulations are largely based on idealized 3-D models of the Earth’s geological structures. To validate these simulations, scientists would have to wait for an actual earthquake to occur. Now researchers at MIT and Stanford University have developed a new approach for predicting how much shaking earthquake-prone regions may experience — without actual earthquakes. The approach, outlined in this week’s issue of Science, generates virtual earthquakes using data from ocean waves. As waves crash against coastlines, they ripple inland as ground vibrations. While these signals are extremely small compared with the shaking generated by an earthquake, seismic stations can nevertheless detect them, even over large distances. Such real-time signals can help scientists better understand how earthquake waves travel through various structures in the Earth’s crust. As a test case, the team applied its method, called the Virtual Earthquake Approach, to the Los Angeles basin — a region with a dense array of seismic stations. The researchers analyzed ocean waves as detected by stations in different locations in Los Angeles and along the nearby San Andreas Fault, comparing the signals received at pairs of stations. The differences between stations can be used to calculate the speed at which surface waves travel through crust, and how they might shake up a region. From their results, the researchers determined that ruptures along the San Andreas Fault could cause shaking that is three times more intense in downtown Los Angeles than in surrounding areas. This amplified shaking is caused by a funneling effect in which seismic waves are siphoned through sedimentary basins into the Los Angeles area. Ruptures that begin in the south, near the Salton Sea, and move northward along the San Andreas would cause a bit more shaking in Los Angeles than those spreading south. German Prieto, an assistant professor of geophysics in MIT’s Department of Earth, Atmospheric and Planetary Sciences, says it remains impossible to predict when or where earthquakes will occur. But predictions of how much shaking a region is expected to withstand when an earthquake occurs may help vulnerable communities establish stricter building codes and require sturdier structures. 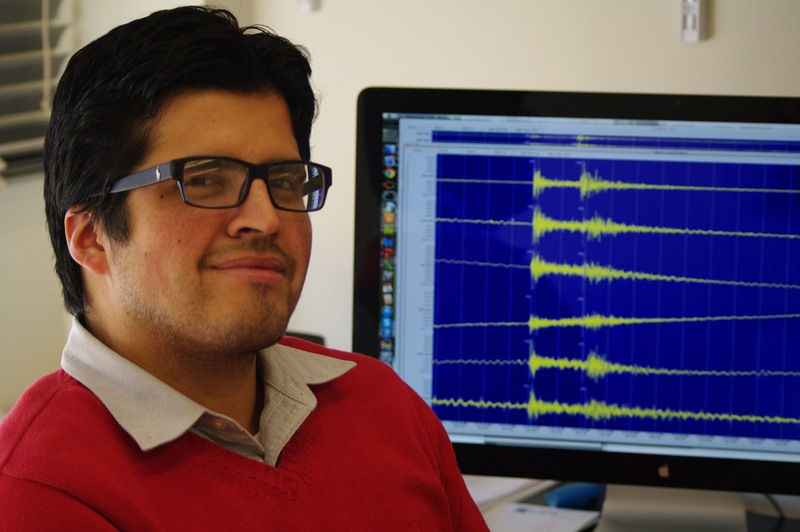 To generate a virtual earthquake, Prieto and his colleagues analyzed signals from ocean waves at pairs of seismic stations. The group processed the signals between pairs of stations situated along the San Andreas Fault and across the Los Angeles basin, summing up the data to create a large virtual earthquake that propagates from station to station. Depending on the combination of seismic stations, the researchers can generate virtual earthquakes at various locations. Extrapolating from the ocean wave data, the team generated 96 scenarios of magnitude 7.0 earthquakes along the San Andreas Fault, including ruptures south of Los Angeles. The resulting predictions showed the Los Angeles basin experiencing three times more intense shaking than surrounding mountainous areas; the shaking was even more intense when earthquakes propagated northward, rather than southward. Thomas Jordan, a professor of earth sciences at the University of Southern California, says the group’s approach is general enough that it can be applied even in areas where scientists lack accurate models of geological structures. The technique, he points out, depends upon the availability of multiple seismic stations, which not all quake-prone regions possess. Nevertheless, the tool may spur communities to set up seismic stations to accurately predict ground shaking from future earthquakes. Germán Prieto uses seismic records to understand earthquake sources, the interior of the Earth, and how each affects the ground motions felt on the surface.